HFT spoofing is rooted in old floor tactics and I've said as much in several interviews and articles on market manipulation. Here is an example on a screen, but the likely motivations are rooted in old Gold Bullion Banks behavior.From the Aug 25th article: Why was $1.5 Billion in Gold dumped in a few minutes? What would make someone dump $1.5BB (10,000 contracts) of Gold into an illiquid market if not to spoof it lower or mishandle an order for an exiting client? What could the origin of sincere, general, urgency be for this to happen? That is not rhetorical. Mind you we are short and think this is nonsense. Who Benefits From That Trade? The original short covers their short position of anywhere from 8 to 10k lots.This is also why thin mkt is good, as the spoofer will likely be the only buyer. if not totally filled wait until the next thin mkt opportunity and do it again. 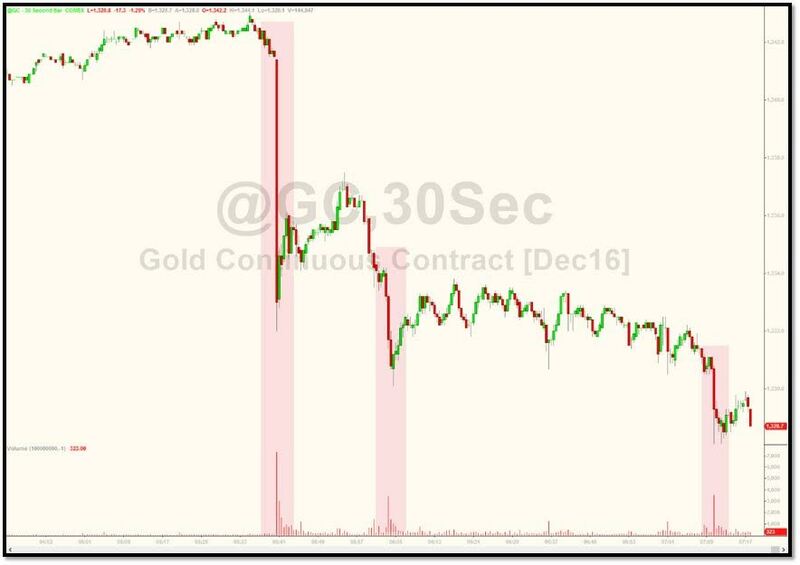 Full Article Here: Why was $1.5 Billion in Gold dumped in a few minutes? First of all, smaller firms and locals were permitted to survive if they did not get in the way. I got in the way in Energy options, Brian Beatty got in the way in Silver options and others were chopped down if they were a threat to the players. We were just a repository of all OTC risk as marketmakers in options. Most of the spoofing was done in futures because that is where the continuous order flow was. OTC options traders were less sophisticated then and basically handled client flow. They laid off their risk on us while they did the same trade at a better price OTC. Flow trading did not need too much knowledge of option greeks. Banks did not see the need as the lower lying fruit was running-in futures clients. Sometimes OTC traders laid off their risk even before doing the trade OTC. We called this "trading with a net". The main difference between Bullion Banks and Trading Firms like Cooper Neff, Berard Capital, CRT, and Prime rested in what we were taught was the 3C's vs the 3Ts. 3C Example- A banker once buried a trader in front of his peers who wanted a raise: "You don't make the money for us. The chair you sit in does. I can put anyone in it and the profits will be the same." Computer technology was leveling playing fields in every industry. A tool with which the little guy can compete and survive. 3T Example- Interactive Brokers was once Timber Hill marketmaking. Timber Hill itself was a Cooper Neff type firm, but with a centralized model for growth. Now they own the order flow after disenfranchizing the Banks with whom they competed. The three C's shrank in importance as the 3 T's gained (Timber Hill). Equity markets moved to screens. This empowered Technologically savvy firms like Timber hill and Hull Trading. Price transparency was the first blow to Banking's protective moat. In commodities, Tech was accepted more slowly. In the end all 3C's were diminished in importance. Banks had a problem, especially with screen-based trading. Captive Clients- customers increasingly become free agents due to abuse of relationships, counterparty defaults, and need to diversify all risks. Trading Firms gained the upper hand during this time. Spoofing by banks continued on screens, but was more obvious in thin market times (Gold at 4 A.M.), or in markets where a lack of diverse counterparties/participants (read TBTF) made it easier to know who was doing what. Price was transparent. But now counterparty was not. The banks had no real flow. The liquidity providers had the flow now. "Price is the best advertiser". Marketmaking firms began paying for order flow because they were the low cost producer. Timber Hill became Interactive Brokers during this time. TH essentially bought the orderflow wholesale and changed their model from marketmaker to broker. Hedge funds using products like ORC cut deals with exchanges seeking to port their business from the floor to the screen. Banks could not keep up. So the industry started to integrate vertically. Banks bought trading firms (GS bought Hull). This made sense. They had the luxury of incumbency to not grow their own technology. Easier to buy when the need became apparent. Thus, the Big Banks adopted the 3T model. But the only T that mattered was technology. Combining technology and lobbyists, they gamed the market structure to build a new franchise with a protective moat enforced by law. The Banks were again able to front-run client business legally. Spoofing became electronic on their in-house trades. Then the HFT firms sprung up. Marketmaker types evolved to use their Tech knowledge, pattern recognition skills, and risk management to start doing to Banks what the banks did to them on the floor. Any resting order that was not immediately executed was game. And the marketmaking firms that did not convert to HFT strategies got killed. Liquidity was destroyed, as real marketmakers left the business. what remained were HFT firms fishing for stops and Banks front running their clients.Then the Banks started using their faster pipelines to spoof for stops as well. The recipe for the Flash-Crash was born. I had experienced manipulation from floor to screen and was able to see patterns of abuse migrate form floor to screen. At first the increased venues were all that mattered in Commodities. From 2004 to 2006 I traded profitably in Energy and Gold off-floor. From my desk, Echobay arbed Clearport, the Floor, and Globex venues using a trading model, a cell phone, and a single landline. It was easy for a while.The bigger trading firms were still killing it in Equities. Banks were still behind the curve in Commodities. But that changed as Banks and Trading firms locked in Marketmaker status on Globex. We wanted to become electonic marketmakers as well. But our client would not finance it. So in 2006 Echobay pitched the same client, Platinum Partners CEO Mark Nordlicht on a more macro Arb in the Nat Gas EOO market. We got lucky and had the ability to self finance in the HFT world. Echobay became an electronic marketmaker in Oil and Gold, once again against the big boys. That is when it became clear that marketmaking was dead vs these guys. They had won. Despite using top tier software, a collocated server, and safety valves my firm still got spoofed in Oil, Gold, Natural Gas, Silver and other markets. It kept up until we realized our trades were getting throttled because of our i-link setup.This was a whole new education for me. Something that would have helped if the exchange had told us. The actual technology was rigged to make me slower despite having the same hardware speed of major players. We had that changed and the spoofing losses stopped. But all we could do afterwards was watch in amazement as various algorithms tried to slow us down with quote bombs and flashed bids too fast for us to trade, but fast enough for our algorithm to change all our other markets and put us at risk. Latency plays, delta algos removed incentive to show your hand as a marketmaker. But we were obligated by the exchange to do so. Essentially we were there to feed the Big Banks. Faster programs were leaning on our markets which they enticed us to make by flashing us false untrade-able bids. Then trying to trade with our updated values. It was a comedy show. Markets got wider, thinner, and flakier. All the stuff going on inside the real bid/ask was just competing programs looking for real orders. And that was the year the Flash-Crash happened. HFT algo fishing had killed genuine liquidity from marketmakers and replaced it with ephemeral liquidity. Market Flakers have replaced marketmakers.One genuine order generated 10 orders that either"leaned" (front-ran) on the origin order, or flash offers to entice sellers to hit their own (hidden) bid. Everything old was new again. But at nano seconds.